The methanization plant at Aguas Andinas’ Planta La Farfana waste water treatment plant in Santiago, Chile, generates high-BTU natural gas derived from anaerobic digester gas. The natural gas is piped to Santiago’s gas utility, Metrogas, which provides it to area homes and businesses. The pre-existing plant, which produced lower-grade town gas, utilized one flooded screw compressor and conditioning system. SCS Energy’s new sliding vane compressor, conditioning, and biogas separation skids on the pipeline after the existing compressor. The existing compressor, new biogas separation, and new waste gas flare systems each have their own PLC, in addition to the new Balance of Plant PLC to control both the new compressor and the process as a whole. The new Ignition server communicates with the four PLCs through KepServerEX, and a MySQL server for historical logging and SCADA system data. 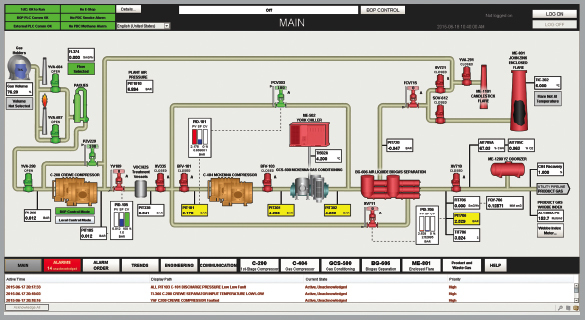 Ignition provides fine-grained control of the new compressor system, and observation and start/stop control of other systems in the plant. Each HMI screen extensively utilizes templates, indirection, and UDTs for rapid development and a high degree of consistency between systems and screens. Valves, motors, analog values, PID loops, and even subsystems utilize templates and indirect pop-up windows for display and control. This project takes full advantage of Ignition’s unlimited tag history, logging every available analog value and making them available to the operator in an easy to use manner. Discrete valve positions and even some pushbuttons are also logged for future diagnosis. The Trends screen can plot any analog historical values against each other. Each analog value display can be clicked to show a plot of that value, including alarm limits and configuration options. From there, a single click adds that value to the others on the Trends screen. A Balance of Plant Control screen provides an operational overview when starting and stopping the plant. Selected analog values and compressor states, with a sparkline plot for each with alarm limits easy visible, combined with state information gives an at-a-glance view of the plant state at any time. 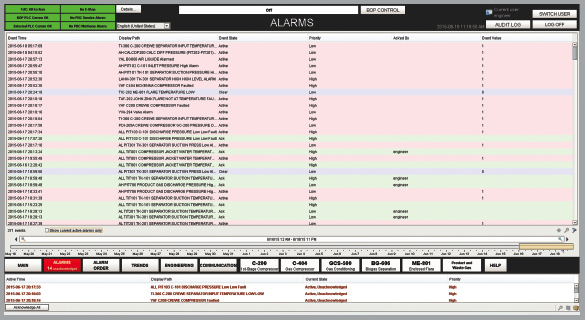 To aid in diagnostics, an Alarm Order screen shows a PLC-generated list of alarms in activation order. This is useful when determining which alarm was first out when multiple alarms are generated from the same event. Since it’s generated by the PLC, the order will be correct regardless of OPC delays or scan times. Ignition’s Auditing feature provides an additional diagnostics tool. We enhanced it by adding an Audit Log query screen, enabling a high-level user to filter based on any column in the audit log table. Since the project is deployed in a Spanish-speaking country, we used Ignition’s Translation Manager to easily switch between languages for both the Spanish-speaking local engineers and operators, and the English-speaking developers. One large problem we found in diagnostics is device-permissive conditions: a system won’t start because some permissive condition is not met, but the operator can’t see what the problem is without calling an engineer to search through PLC code to find the issue. Since Tactical Controls uses a consistent permissive rung structure in PLC code, we were able to use a SQL table and Ignition’s Template Repeater to display permissive conditions for each device right in the HMI. The operator can easily tell what is preventing their equipment from starting! Methane plant graphical overview of the system layout. Alarm History screen to keep track of past alarms at the plant. 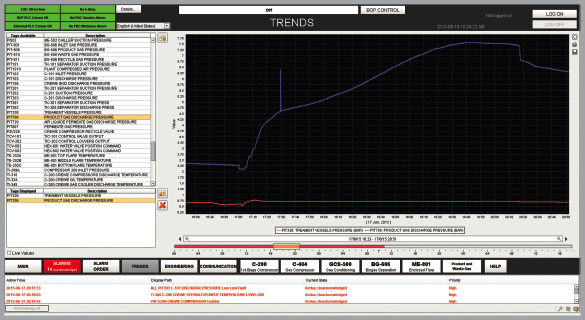 Custom trend screen developed for displaying process variables in the Methane Plant.